Despite advances in computer technology, power outages continue to be a major cause of PC and server downtime. Protecting computer systems with Uninterruptible Power Supply (UPS) hardware is often part of a total solution, but power management software is also necessary to prevent data corruption. 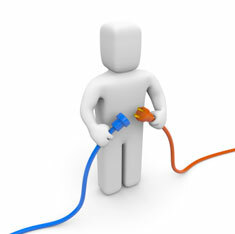 An extended power outage can prevent computers from initiating their required shutdown procedure. PC and server operating systems are not designed to support abrupt losses of power known as “hard” shutdowns, but rather rely on a set of built-in processes that prepare a computer for a “graceful” shutdown which includes saving memory and stopping applications and services. This is according to Christian Bertrand, vice president: Middle East and Africa at APC by Schneider Electric who says that a UPS can protect the system and improve server availability by allowing users to continue working without interruption during a short power outage. “During an extended outage, if the system is equipped with UPS shutdown software, it can perform a graceful, unattended system shutdown before the UPS battery is exhausted,” he adds. There are several ways to configure UPS software, he advises. “The simplest configuration, used in both server and workstation deployments, involve protecting a single computer with a single UPS, which communicates with the computer over a serial or USB cable. UPS software is installed on the computer and in this case the UPS is managed locally by the connected computer. In this situation, Bertrand says all three computers will have graceful shutdown capability, but management of the UPS is handled via the computer connected directly to the UPS. Although this scheme can be extended to handle up to 24 computers, APC does not recommend such an approach due to the additional cabling required. Purchasing a UPS with extended runtime capability merits serious consideration when extended outages are common and the cost of downtime is high. In cases where hours of runtime are required a generator is recommended in addition to a UPS as a few minutes of runtime is still required to maintain the load until the generator comes online. Applications are only as available as the network that they are accessed through. Power protection for hubs, routers, and switches is an essential but sometimes overlooked ingredient in ensuring availability applications. Additionally, if three or more computers are protected by a single UPS, the shutdown software requires the network to be up during the power outage in order to communicate properly. If the network is unprotected, graceful shutdown of the computer will not be accomplished. The time required to properly shut down the operating system varies from system to system – some e-mail servers can take upwards of 20 minutes to shut down. Therefore users must ensure that their UPS software’s settings take into account each computer’s specific requirements and are set properly. “Without shutdown software installed on the protected computer, the net effect of the UPS is simply to delay the inevitable. Regardless of which configuration, which best practices, and which particular UPS software is utilised, APC highly recommends customers not overlook this requirement – the small effort involved in installing and configuring such software can well be worth it in the event of an extended power outage that exceeds the runtime of the UPS,” he concludes. APC by Schneider Electric, a global leader in critical power and cooling services, provides industry leading product, software and systems for home, office, data center and factory floor applications. Through its unparalleled commitment to innovation, APC provides pioneering, energy efficient solutions for critical technology and industrial applications that are well planned, flawlessly installed and maintained throughout their lifecycle. APC solutions include uninterruptible power supplies (UPS), precision cooling units, racks, physical security and design and management software, including APC’s InfraStruxure® architecture, the industry’s most comprehensive integrated power, cooling, and management solution. As a global specialist in energy management with operations in more than 100 countries, Schneider Electric offers integrated solutions across multiple market segments, including leadership positions in energy and infrastructure, industrial processes, building automation, and data centres/networks, as well as a broad presence in residential applications. Focused on making energy safe, reliable, and efficient, the company’s 100,000+ employees achieved sales of more than 15.8 billion euros in 2009, through an active commitment to help individuals and organisations “Make the most of their energy”. How To Use Pinterest To Market Your Business Website? How secure is your data on Mobile devices? Thanx “the success ladder” am inspired.